What better way to kickstart your day than with a sun salutation that will awaken your soul? Emma Mildon, author of EVOLUTION OF GODDESS, shares a step-by-step guide to performing a sun salutation that’s ideal for every modern-day goddess. Essentially, we are about to do a vinyasa yoga flow, which performs a salute to the sun—a sun salutation, or surya namaskar in Sanskrit. As with all practices we have been exploring, there are different variations of sun salutation, so it is always best to explore the practice that resonates best with you personally. It is also important to listen to your body, so don’t try to overstretch yourself. I recommend following a video demo if you are new to the realm of yoga. I personally liked Yoga Journal’s how-to articles and videos when I was starting out. Lifting your heart and circling your arms upward above your head, imagine yourself rising up like the sun, opening up to the world. You can gently arch your back to look up at your hands when you reach the top. Exhale and fold forward bending yourself in half—this is uttanasana (standing forward pose). Ground your hands on your legs or the floor and lift your spine toward the horizon into ardha uttanasana (half bend), imagining your back is a flat line like the sun halved by the horizon line. Fold back into uttanasana (standing forward pose), and recognize how your body is starting to warm up. Exhale, and step or jump your feet back, then bring yourself into downward-facing dog. Tailbone tall in the sky and your palms and feet grounded on the earth. Rolling through your spine, lowering your tailbone, bring yourself into a four-limbed staff pose (similar to when you are doing a push up except your arms will be tight against your body instead of wide), also known as a low plank, which is called chaturanga dandasana in Sanskrit. Inhale and roll over your toes back into your downward dog. Then step your feet back together, or jump your feet back together, for your standing forward fold. Back to half bend. Then raise your hands up again, bringing your hands together, and bring them over your heart center in prayer. Notice how you feel. Notice your breath. Do you feel warmer? Repeat the yoga sun salutations three to four times. 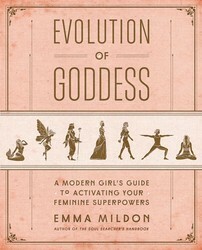 For other rituals, meditations, and exercises that tap into your feminine superpowers, pick up a copy of EVOLUTION OF GODDESS by Emma Mildon. More from Tips on Life & Love: Which goddess are you channeling today? Take a short quiz to find out! 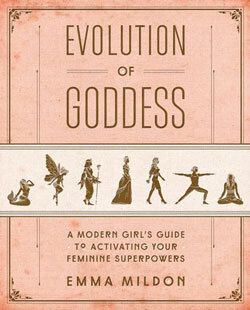 Excerpted from Evolution of Goddess by Emma Mildon. Copyright © 2018 by Emma Renée Mildon. Used by permission of the publisher. All rights reserved. Emma Mildon is an international columnist, surfer, author, and publicist. As a world traveler, she has sought out medicine men, healers, physicists, authors, and artists to explore spirituality, channeling, and healing, and has also practiced meditation, yoga, and life coaching. Through it all, Emma has connected with like-minded soul searchers across the globe and aims to provide fun spiritual wisdom to her generation. She currently lives in Auckland, New Zealand.